Sisters are more than just related, Sisters are best friends forever. Sisters Customizable Coffee Mugs make perfect gifts to give to your Sisters. Our Personalized Mugs proudly displays your love and friendship you have with your each other. Select one for each of your sisters to celebrate your love. These personalized sisters ceramic coffee mugs make excellent gifts for your sisters on Sister's Day, Family reunions or at a family breakfast. Personalized Sister Ceramic Coffee Mug is Dishwasher safe & includes FREE Personalization! Personalize your Sister Ceramic Coffee Mug with up to 12 Sisters Names! Mugs are available in different sizes ranging from 11 ounces to 20 ounces. I loved it, it looked great wnd came in perfect condition. Lovely! Good quality! Just as pictured! Very nice. I am sure my sister will love it. Our Personalized Sisters Ceramic Coffee Mugs proudly display your love and friendship you have with your sisters. Select one for each of your sisters to celebrate your love for each other. 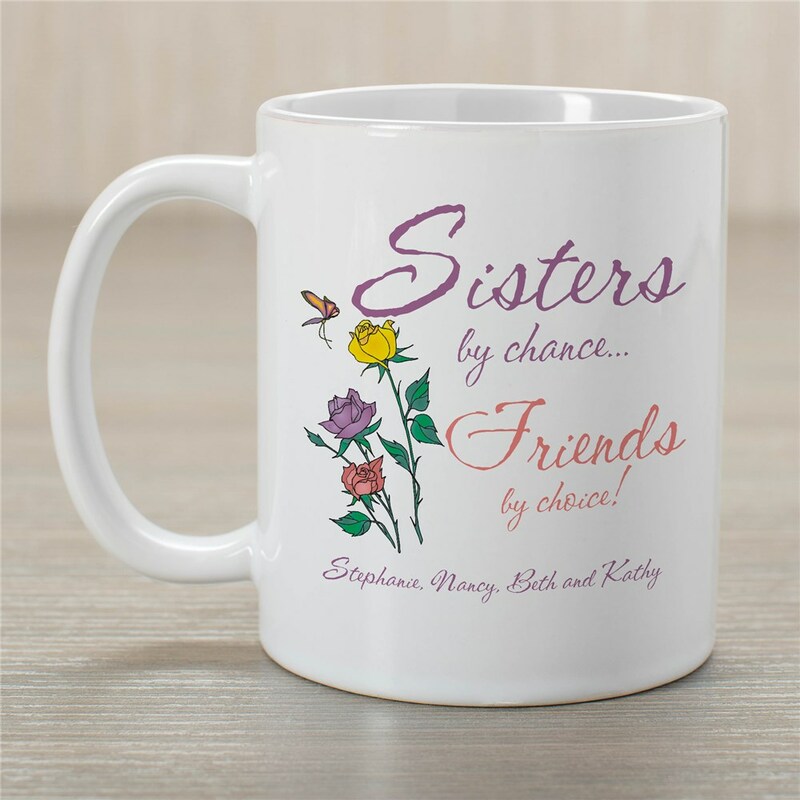 These personalized sisters ceramic coffee mugs make excellent gifts for your sisters on Sister's Day, Family reunions or at a family breakfast. Shop GiftsForYouNow.com for all your Sister Gifts & Friendship Gifts and show your Sister how much you love her.